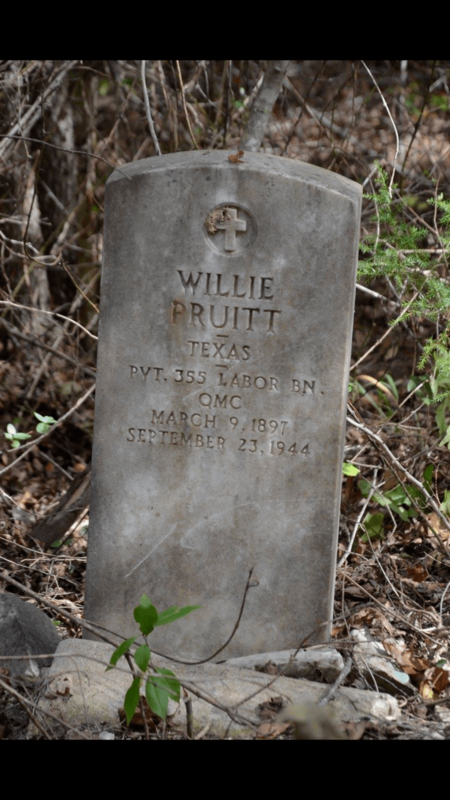 Headstone of military veteran Willie Pruitt located in Old Macedonia Cemetery. On Saturday, November 5, over 25 volunteers assisted in the inaugural clean-up of the Old Macedonia Cemetery, located just West of the Linden Cemetery. Volunteers came from as far away as Baton Rouge, LA and Birmingham, AL. Over 20 burial locations were identified. The earliest being 1899 and the last known to be in 1947. The volunteers cut vegetation and years of overgrown vines to clear the burial grave sites. Many unmarked graves were marked. A walking path was cut from the North end of the cemetery, West of the chain link fence, to ease access to the site. 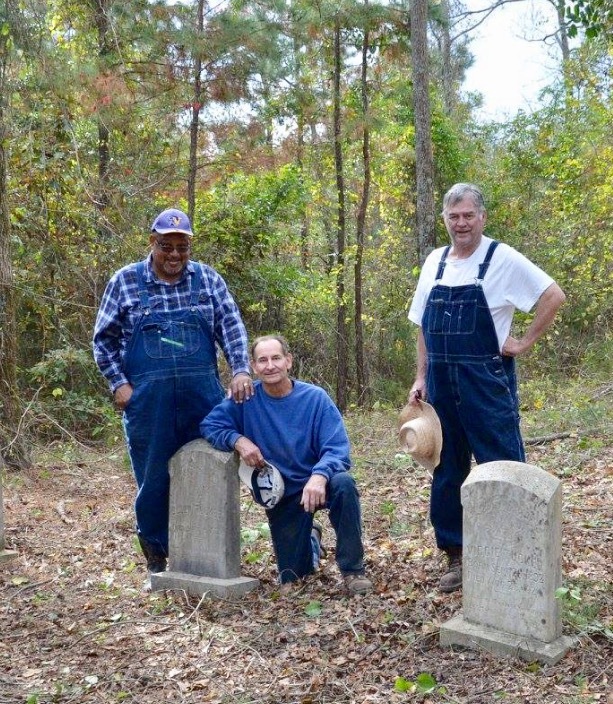 Headstones uncovered by Darrel Barrett, Sam Higdon, and James Penny (left to right) and other members of the volunteer crew at Old Macedonia Cemetery. It is estimated that there are roughly 50,000 cemeteries in Texas. These range from single, isolated and often unmarked graves to expansive cemeteries spanning hundreds of acres and reaching up to hundreds-of-thousands of burials. Many of these cemeteries, like the Old Macedonia Cemetery, are endangered due to lack of historic context and knowledge of their presence or exact location. The Cass County Probation team (more than 15 workers and essential equipment), led by Joby McDaniels. Sam Higdon, Linden Heritage Foundation President, for bringing his power equipment and engaging in the more difficult tasks of the day. James Penny, Linden Cemetery President, for bringing his tractor and bush hog, for the heavier work. Thomas Northcutt, Sr., Deacon, Macedonia Missionary Baptist Church. Larry Love, Albert Brown, Gary Webster, and Darrell Barrett, members and former members of Macedonia Missionary Baptist Church; also members of Linden-Kildare Class of 1973. Jana Clinkscales Bounds and Sandra Westbrook Scoogs for bringing donuts and water. Jo Anna Duncan, Front Porch Treasure Studios, for photos. Sue Morris Lazara, Kay Temple Stephens, and Joe B. Lovelace for their vision and encouragement. The Foundation thanks Mason Darrell Barrett for preparing the description of the work at the Cemetery and Jo Anna Duncan for providing the photographs. Both Mason and Jo Anna are Charter Members of the Linden Heritage Foundation.